Placed in the basket skimmer, Water Lily® absorbs and retains all oily substances brought through by the circulating water. With time, Water Lily® turns colour according to the type of pollution it absorbs; suntan lotions, pollens, air pollution. Thanks to its microfibers specially treated to retain fat molecules, Water Lily® is a highly-efficient specific absorber of the oily substances found on the water’s surface allowing it to stay pure and clear. Its particular flower shape increases the perimeter where residue concentrates. Thanks to its lipophilic and hyrdophobic properties, Water Lily®’s fibrous matter absorbs all the oily substances from the water’s surface without the need of chemical products. 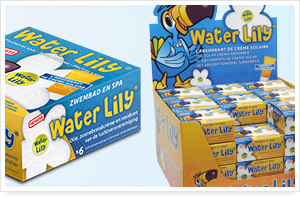 Water Lily® comes in boxes of 6 for easy stocking. Water Lily® Display pack of 36 boxes. Plain refill cartons of 36 boxes. 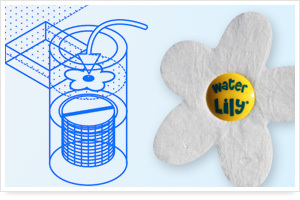 How and why does Water Lily® only absorb oily substances ? Water Lily® is made of a microfiber material specially treated to retain fat molecules present on the surface of the water. The fibers have both lipophilic and hydrophobic properties. The former is a substance which attracts and retains oily substances, and the latter is a substance which repels water. Thanks to these characteristics, Water Lily® absorbs the oily substances from swimmers’ suntan lotions and atmospheric pollution while remaining afloat as it is not able to absorb water. In other words, Water Lily® is an “intelligent” absorber. Can I put Water Lily® into the pool itself ? Certainly, however, even though the central floating disks means that the Water Lily® is not very sensitive to wind, the Water Lily* will eventually be drawn into the basket skimmer as the pump circulates the water. It works the same whether in the pool or in the basket skimmer – the water ends up going through the skimmer one way or the other. Can I use more than one Water Lily® at the same time ? If your pool is really oily from frequent swimming, heavy atmospheric pollution (urban environment) or pollen build-up, we suggest you use several Water Lilies as their combined effects will ensure a clean, clear water surface. Can Water Lily® be used in spas ? Yes, spas are also subject to oily build-up from the natural fats in the human body especially as there is less water quantity involved. We strongly suggest Water Lily® to alleviate this problem. Further, many of our clients in hotel, resorts, municipalities, etc. have expressed their appreciation and satisfaction with this product. 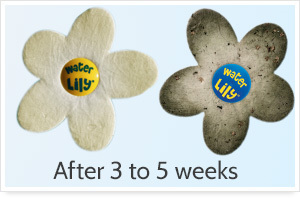 What if my Water Lily® doesn’t change colour ? 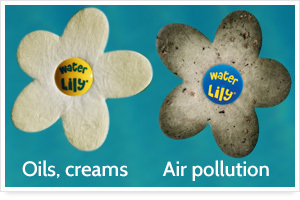 Each type of pollution causes Water Lily® to turn colour differently. It turns brown to black from air pollution and ivory to beige from pollen and vegetation. It may not become too discoloured when absorbing suntan lotions and creams as neither product has a colour to begin with. This doesn’t mean your Water Lily® is not working or that you shouldn’t change it as suggested. How often do I need to change my Water Lily® ? This totally depends on the frequency your pool is used and the nature of the environment – on average, every three to five weeks. Why did you chose the name Water Lily® ? The name was chosen because of the particular form of a water lily or Nénuphar in French. During the original product study, our Research and Development team noticed that the fat molecules attached themselves most particularly to the perimeter of the object which was to be, at first, round or oval. 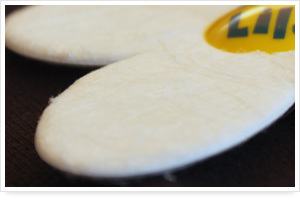 Thus, to increase efficiency, a flower shape was chosen to allow for more of an absorbing surface. Besides, a water lily is an elegant water plant, perfect for your pool. What proof do I have that it works ? In 2005, the first year Water Lily* was patented and marketed, it was chosen for the Special Prize by the “Féderation des Professionnels de la Piscine” at the Innovation Awards Ceremony. Chosen for its innovative features and its efficiency, Water Lily® couldn’t have had a better launching. Since then, its success has been incontestable. Water Lily® can be found throughout Europe and even in Canada ! Place Water Lily® on the surface of the water in the basket skimmer. Disposable, Water Lily® should be changed every 3 to 5 weeks according to how often the pool is used.